This August I'll be returning to Ireland! To be honest, I can't wait - during our last trip Shannon and I had a blast (much of it a water blast since the weather was nuts) and vowed we would return. This time the four of us will be continuing our exploration and plan to pick up right where we left off. I'm looking forward to more normal weather as well which will make the drive around the country even more fun. Most of these are already on our list to some degree though we may branch out a bit as well to areas previously unexplored. 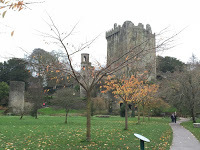 Do you have favorite/top places to visit in Ireland?